Touring handlebar bag, complete with many practical features. Solid inner frame made of glass fiber reinforced polyamide and adapter plate on the backside. Large front pocket and several inner compartments. Detachable rain hood and shoulder strap. 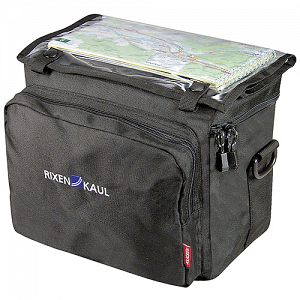 The transparent map holder is also completely removable via snap fasteners. For maps up to W 24cm x L 27cm.